Do you have US$1.7 billion to spare? If yes, then you may have a shot at two Mistral-class amphibious attack ships (aka helicopter carriers) that France built for the Russian navy. For that price (at least that is what the current contract stipulates), the interested party would obtain two 21,000-ton multi-purpose warships that can perform a wide range of missions, including amphibious landings, anti-submarine and anti-piracy patrols supported by 16-30 helicopters on board, play role as a command and communication center, or as a hospital with state of the art medical facilities assisting disaster relief operations. 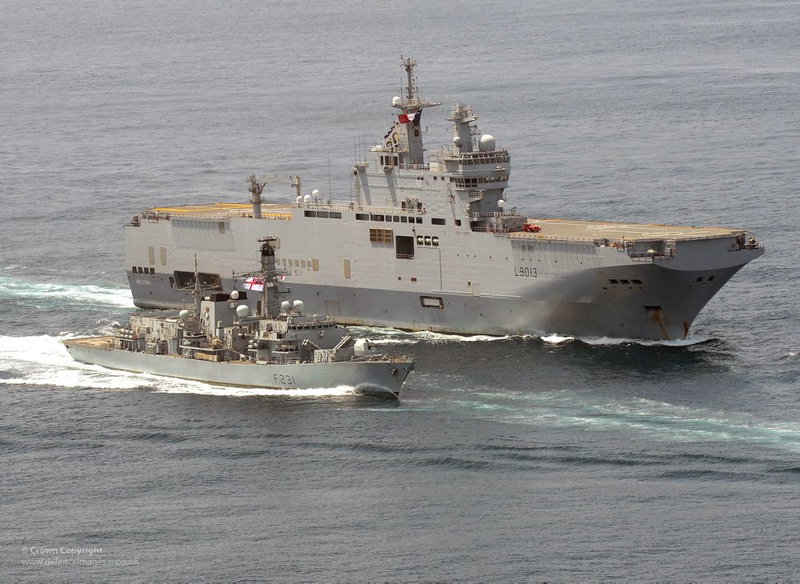 Type 23 frigate HMS Argyll (foreground) is pictured in company with her French counterpart FS Mistral off the West Africa coast. Image Credit: CC by UK Ministry of Defence/Flickr. The Mistral’s versatility should be very attractive to a number of potential buyers, and France may not have great problems selling them. That is unless Russia’s claim that France cannot sell or use the ships without Russia’s approval is correct. Moreover, since both ships were specifically adapted for Russia, whoever is interested in purchasing them will have to also add the costs of retrofitting the vessels to meet their needs. For Russia, interest in Mistral-class was an open admission of the limitations of its own shipbuilding industry. Following the collapse of the USSR in 1991 and financial problems of second half of the 1990s, many ongoing projects were cancelled and ships in final stages of completion were scrapped or left to rust. Russia under Vladimir Putin seems eager to revive the glory of Soviet shipbuilding, including plans to build an aircraft carrier. However, it lacks the know-how required for the kind of multi-purpose capabilities offered by the Mistral. Russia’s acquisition of the two Mistrals could have been relevant for Northeast Asian security as the Kremlin planned to deploy both vessels (named after cities of Vladivostok and Sevastopol) as part of the Pacific Fleet based in Vladivostok. Whether the rationale for this deployment was checking on Japan or China is now irrelevant. The odyssey of the two Mistrals from French shipyards to Russian ports ended up prematurely following Russia’s armed intervention in Ukraine that resulted in wide array of sanctions, an arms sales ban included. At one point, Paris insisted that standing contracts would be upheld, however, developments in Ukraine saw no improvement, and the sale went south (though a final decision has yet to be made). And this is where China comes into play. Or to be more precise, that’s when the speculation begins. The speculation began following a French navy visit to Shanghai, which included a Lafayette-class corvette and a Mistral-class amphibious assault ship. The Taiwan-based Want China Times (WCT), referring to Chinese military bloggers, reported on the possibility of the sale of the two vessels to China on May 10. Soon enough, the WCT report was picked by Russian government-run Sputnik News and other news outlets. The Moscow Times editorialized about “4 Things France Can Do With Its Russian-Ordered Mistral Warships.” On the Western side, theBusiness Insider and Newsweek reported in similar fashion. What was striking about all those reports was their failure to mention the EU-wide sanctions imposed on China after the Tiananmen crackdown on June 4, 1989. Not all media displayed this ignorance. The Diplomat magazine was among the honorable few that at least mentioned the EU arms sales embargo, although only in passing (a follow-up article corrects this omission and provides an excellent overview of the embargo issue and the broader context that makes the sale impossible). 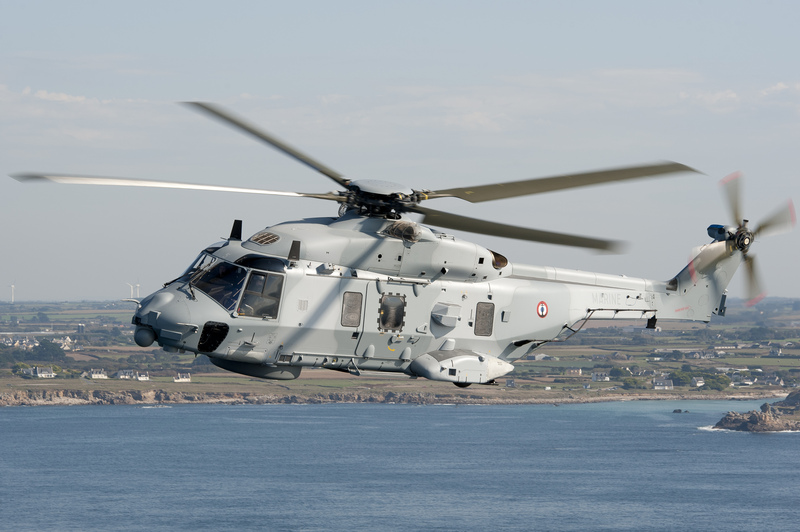 Airbus-built NH-90 NFH Caïman helicopter can operate aboard Mistral-class ships. Image Credit: Wikimedia Commons. EU countries’ military exports to China, excluding Hong Kong and Macao, reached a total of 134 million euros in 2006, according to the EU Annual Report on Arms Exports. However, the real export figure is higher, since certain countries do not provide data. On top of actual exports, EU member states in 2006 issued licences for arms exports to China worth 292 million euros. During 2007 reported exports were somewhat lower, at 92 million euros, and the value of licences issued was 210 million euros. In 2007, France accounted for 94 percent of licences and 99 percent of exports to China. Europe’s main exporters of military equipment to China also include the U.K., Austria, Italy and Germany. France’s approach is that the EU arms embargo covers lethal military equipment and major weapon platforms. However, exports of non-lethal systems and dual-use items are permitted, e.g. naval and aircraft electronics and platforms, optoelectronics, transmitters, radar and other equipment for non-combat use. Oddly enough, Stockholm’s interpretation of the embargo also includes a ban on selling weapons to Taiwan. The possible sale of two very capable warships to Russia was controversial even before Moscow decided to annex Crimea and send “volunteers” on “vacation” to Eastern Ukraine. Following the 2008 Russia-Georgia war over separatist regions of Abkhazia and South Ossetia, critics argued that next time Moscow decided to teach smaller post-Soviet republics a lesson, it could be delivered from aboard of newly acquired (and made in the EU) helicopter carriers. France nevertheless proceeded with the deal until it became politically impossible to deliver the weapons. It does not require much imagination to see what would follow should Paris ever seriously consider a sale to China. Thus, the Philippines, Japan and Taiwan need not worry about a sudden boost of China’s amphibious capability courtesy of France. However, that is about the only thing that China’s neighbors can be relaxed about. With Beijing’s island-building spree and salami-slicing approach, the regional security environment has been deteriorating, and it may not be too long before the People’s Liberation Army Air Force, operating from its new bases, starts to enforce a South China Sea air-defense identification zone (ADIZ). Part of the speculation surrounding a Mistral sale is based on a correct assessment that Beijing could definitely use such amphibious capabilities in the South China Sea and of its general efforts to transform the PLA Navy into an ocean-going naval force. However, rather than rely on foreign sales, Beijing is more likely to build its own helicopter carriers. Unlike the Russian shipbuilding industry, which is in dire need to re-invent itself in the midst of fiscal uncertainty, Chinese shipbuilders can built on decades of incremental improvements. News of new weapon platforms and possible arms sales are inherently prone to speculation (the sales of Russian-made S-400 air-defense systems and Su-35 fighters to China come to mind). The lesson in all this is that media should not read too much into friendly port visits and beware of overly imaginative Chinese military bloggers. This piece was originally published on Thinking Taiwan on 21 May 2015. 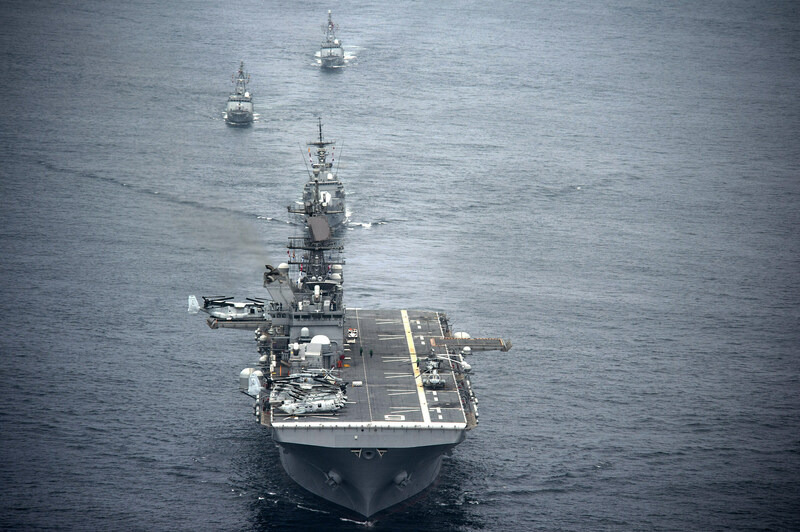 The amphibious assault ship USS America (LHA 6), front, and Peruvian Navy ships sail in formation during a passing exercise in the Pacific Ocean Sept. 3, 2014. LHA-6 serves similar purpose as Mistral-class amphibious attack ships. Image Credit: CC by U.S Department of Defense/Flickr. ← China’s ADIZ in the South China Sea: Coming Soon to a Sea Near You?